Is there really buyer's remorse for Trump voters? Congratulations! If you’re reading this, it means you’ve made it through the first two months of the Trump administration. Amidst heated confirmation hearings, accusations of Russian involvement in the American Democratic process, Michael Flynn fired for “lying” and then publicly asking for immunity, lots of tweeting, and a dramatic failure of an Obamacare replacement among other things, you made it. Well done. In all seriousness, these eventful past 70 days have been interesting to say the least and the American public has noticed. In fact, Trump is not only the first President to have a negative net approval rating this early into his first term, but he has also already garnered the lowest approval ratings of any president in his first year, ever. With a 44% approval rating in our national survey (conducted before the final days of the health care debacle), Trump falls far behind both Republican predecessors such as Ronald Reagan (51%), George H.W. Bush (51%), and George W. Bush (57%), and previous Democratic presidents Barack Obama (76%), Bill Clinton (58%), and Jimmy Carter (66%). This fact is a great talking point for the President’s detractors, but there is more to an approval rating than just the topline numbers. In our latest national survey, we wanted to dive deeper into Americans’ perceptions of their new president after one of the most contentious elections in modern history. We wanted to understand who views him favorably (and who does not), who is satisfied with the job he is doing so far, and who just really, really wants these next four years over and done with. Furthermore, we wanted to gauge the opinions of three groups that received a heavy focus throughout the course of the 2016 election: America’s working class, Republicans, and women. We should begin this section by saying that the respondents we classify as working class (in our case we defined this as those with an annual household income of $60,000 or less) favored Hillary Clinton, 41% to 39% in the 2016 election according to our survey data. However, these same people reported voting for Obama in 2012 by a much larger margin (48% to 30%). Even accounting for potential intentional or unintentional errors on self-reporting vote choices, it’s clear from this comparison that Trump’s ability to increase the GOP vote share within this cohort was one of the keys to his victory. In general, this group of Americans is not all that enthused with Trump in office so far. Forty-five (45) percent view him favorably, just one percentage point higher than the total average, and 47% view him unfavorably. This cohort has similar opinions to the public at large when it comes to the President’s job approval and how he’s lined up with their expectations so far. Interestingly while a plurality of this group has an unfavorable opinion of Trump, his job approval numbers show a bit of a different story, as we explain below. Typically, polls will ask if you approve or disapprove of how an elected official is doing at their job. Our view is that yes or no approach misses important nuances and does not paint a complete picture. We instead ask this as a three-choice question, allowing respondents to say they like the outcomes but don’t particularly like the methods to achieve them. Under a binary approach, voters in this category must decide which way to answer, but either answer is not actually true, since they do not really approve, but at the same time do not completely disapprove either. Among working class Americans, 34% approve of what Trump has done so far and how he’s gone about it, 14% approve of what he’s done but not how he’s gone about it, and 40% disapprove of what he’s done and how he’s gone about it. So, if you put the people who approve on at least some level, close to 48% of this group fall into the approve category, almost 10 points higher than his vote share. At the same time, only about one in four (27%) of working class Americans feel Trump is doing better than their expectations, slightly less (25%) feel he’s doing worse, and 40% believe he’s doing just about how they expected. Throughout the campaign, Trump zeroed in on a very specific demographic within the working class: white, working class Americans. This group, considered to be in crisis by many, is seeing higher out-of-wedlock birth rates, higher unemployment rates as industries they once depended on (i.e. coal, steel) dissolve as the economy changes, and of course, they are taking a huge hit from the national opioid crisis. Trump was clever by reaching out to them; and it really, really worked. But are these people, who voted for Trump in droves, satisfied with his tumultuous first two months in office? The short answer is yes. Over half of the white working class people we polled (52%) view Trump favorably, significantly higher than the survey as a whole. And, as you can see below, they not only approve of him more than the average, but only one in five (20%) feel Trump is doing worse than they expected. Sure, it’s not a ringing endorsement per se, but this is one of the few groups that generally seems satisfied with Trump in office so far. You’re probably wondering why we chose to discuss Republicans considering they won bigly in November. But we also remember thinking all throughout 2016 that the Republican Party was at a major crossroads, more so than they were with the rise of the Tea Party. Moderates - even congressional leadership - felt alienated by the rise of an ultraconservative presidential candidate. But how does this tension relate to Republican voters? And are these tensions eased by approval of Trump’s first 70 days? Essentially, we wanted to see if that alienation and party confusion was still there, even after the Republican Party gained power over all of the elected branches of government. It turns out that while both groups generally approve of Trump thus far, people who identify as moderate Republicans and those who identify as conservative Republicans are operating at two different levels, and conservative Republicans are really, really, really pleased with how things are going. The general theme among Republicans is great job or greatest job (to use a Stephen Colbert line), while 70% of moderate Republicans say they view Trump favorably, 90% of conservative Republicans (yes, 90%) say the same. At the same time, 26% of moderate Republicans view him unfavorably, compared to just 6% of conservative Republicans. When it comes to job approval, moderate Republicans are also pretty content. Nearly half (48%) say they completely approve of the job he’s done so far, with 34% saying they approve of what he’s done but not how he’s done it, and only 14% saying they completely disapprove. Seems solid, right? Well, nearly three-quarters of conservative Republicans (71%) completely approve of Trump’s job performance. Less than one-quarter (21%) approve of what he’s done but not how he’s done it, and only 3% disapprove of what he’s doing. Now that is a ringing endorsement. Finally, along the same trend, 38% of moderate Republicans think Trump is doing better than they expected, while nearly three in five conservative Republicans (58%) say the same. While nearly one in five moderate Republicans (17%) think he’s doing worse, only 5% of conservative Republicans say the same. Bottom line – conservative Republicans are, quite unsurprisingly, super happy about the Trump administration, while moderate Republicans are very content. While we are talking about Republicans, let’s talk about Trump voters, as they mostly fall into this category. Our numbers point to most moderate and conservative Republicans as quite happy with Trump so far, but a lot of news outlets are hinting at increasing signs that “Trump regret” is forming among those who voted for him in November. However, in our numbers, it is the opposite. We already know that Trump voters’ views on the economy made a 180 degree turn after Trump was elected, but we also see positive movement in Trump’s favorability and job approval. Remember how we said 90% of conservative Republicans view Trump favorably and that seemed like a yuge number? Well, that number is even higher among Trump voters – 92% say they view him favorably. An incredible three-quarters (73%) completely approve of the job he’s done so far, while only 1% completely disapproves. Additionally, just about one in five (22%) approve of what he’s doing, just not how he’s doing it. To paraphrase Sally Field, they like him - they really like him. Similar to conservative Republicans, Trump voters also think things are going really well: more than half (57%) say Trump is doing better than expected, one-third (34%) believe he’s doing as expected, while just 5% say he’s doing worse than expected. We wouldn’t buy into this Trump regret narrative yet. While a few percent would clearly be enough to move a state or two from red to blue, so far we are not seeing a large scale defection. Women have been a major voter target bloc since the 1980 election, when the voting gender gap reversed and women starting turning out more than their male counterparts. For years, the Republican Party has dodged criticism that they are a party governed by old white men, with many pointing out the seemingly constant instances where Republican congressmen discuss issues that affect women with little or usually no women present. So women are probably pissed, right? Well, it’s not that simple. “Women” is a broad term: there are white women, Hispanic women, black women, mixed race women, straight women, LGBTQ women, wealthy women, working class women, and so forth. And not shockingly, they don’t all feel the same way. Unsurprisingly, our results showed a very polarized bloc when it comes to Trump. Some of these groups under the umbrella of “women” are content – and some are the most dissatisfied out of the entire survey. 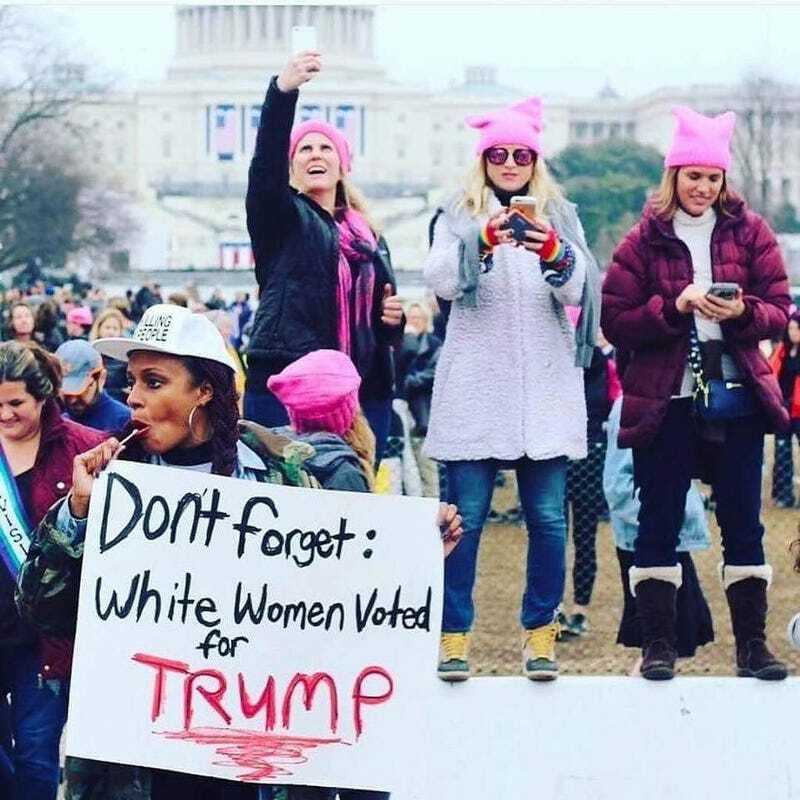 For instance, while a majority of college educated white women voted for Hillary and a majority currently don’t like Trump (51% unfavorable, 45% favorable), we already know that as a whole, over half of white women (53% nationally) voted for Trump. According to our survey, white women are currently split (and even lean towards approval) when it comes to how they feel about his job performance two months in. While about two in five (39%) white women completely approve what he’s doing, a little more than one third (35%) completely disapprove, and 16% approve of what he’s doing but not how he’s doing it. White women are also split on if Trump has met their expectations; about one third (32%) say it’s better than what they expected, two in five (38%) say it’s about what they expected, and just under one quarter (22%) say it’s worse than expected. It’s safe to say that white women are neither ecstatic or totally disappointed with Trump thus far. However, we should point out that when you break out white women by age, there is a significant difference. Looking at white women under and over the age of 45, there is a clear break in opinion. White women under 45 are more likely to view Trump unfavorably (53% to 39%), while most white women over the age of 45 (57%) view him favorably. White women under 45 are also more likely to say they completely disapprove of the job Trump is doing (38% vs. 34%) and that he’s doing worse than expected (26% vs. 21%). Hispanic women generally disapprove of the new president, but they are not unanimous in this belief. Over half of Hispanic women (52%) view Trump unfavorably, with under one-third (30%) viewing him favorably. A little less than half (46%) disapprove completely of the job he has done so far, but only about one quarter (27%) completely approve of what Trump has done and how he’s done it. An additional 10% approve of the what, but not of the how. By far, one of the most dissatisfied groups in our entire survey is African American women. Among this cohort, only 9% hold a favorable view of Trump – three-quarters (75%) view him unfavorably. And nearly the same amount (73%) completely disapprove of the what Trump has done so far in office and how he’s gone about it. When it comes to expectations on Trump, just 3% of African American women say he’s doing better than they expected. Two in five (40%) say it’s worse than they expected, while just under half say he’s doing as well as expected – which, considering how clearly they dislike him, means their expectations were low to begin with. There are also significant differences when it comes to women and what level of education they have attained. While there aren’t many differences when it comes to job approval and expectations, the true variances lie within opinions on Trump himself. Non-college women have more positive views of the president, with more viewing him favorably than unfavorably (47% to 45%). Conversely, women with a college degree are much more likely to have a negative view of Trump, with over half viewing him unfavorably (55%) and less than two in five (39%) viewing him favorably. While women with a college degree are more likely to say that Trump is doing worse than they expected (30% vs. 22%) and that they disapprove of the job he’s doing completely (46% vs. 38%). With this being said, 46% of college-educated women still approve of Trump in one fashion or another, while an equal number flat out disapprove. Since the Women’s March on Washington, intersectionality within the female voting bloc has become more of a mainstream topic, and rightfully so. As the data above shows, women have an incredibly wide array of opinions when it comes to our 45th president, meaning we can’t just view this group as simply “women.” Going forward, every individual group must be heard from, especially given the disparate views. Generally, despite a raucous first two months, the people Trump focused on – conservatives and white working class America – seem happy with the new president. Now, we must point out that this survey was fielded in early March, meaning that the current struggle over the new Republican health care plan to replace Obamacare hadn’t quite reached its peak yet. Nevertheless, we’re not sure how much of an effect it will have on these numbers, especially since many are likely to see this as Congress’ fault rather than Trump’s. This data also shows that, clearly, not everyone is happy. Minority women are especially not happy with what’s going on, and they’re not the only group to feel this way. The conclusion we can draw from the data this early on in Trump’s presidency is that views on him are extremely mixed; large numbers of people don’t have lukewarm feelings about him. They either love him or hate him. The effects of having such polarized views on a new president – unheard of in modern American political history – are yet to fully take form. We’ve already seen that people have begun changing their spending habits and their donation habits in response, but we will have to wait and see how the American people will continue to react to the Trump Administration in the months and years to come.